1. 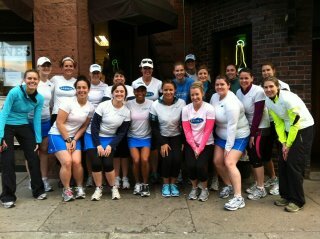 Yesterday was the inaugural run of the 2012 season for The LUNA Chix Boston Run team. As one of the co-leaders of the team, my goal for this season is make sure that the runs are inclusive, non-competitive, and most importantly, FUN. Last night we had 20 women in attendance! It's definitely the biggest group I've seen since joining the team three years ago. Looking at all of those LUNA shirts flying around the esplanade made me so happy. Seeing the group of women running together, having a great time reminded me of why I run, and why I am involved with this team. If you're a female runner (sorry fellas!) in the Boston-area and want to learn more about us you can look at our website and our meetup group page. 2. BOSTON MARATHON WEEKEND! I'm not going to be running in the B.A.A 5k or the marathon BUT I am going to be doing a lot of spectating. I am a really awesome spectator, for the record. I may even a little day drinking. You're only young-ish once, right? And the best part of it? Marathon Monday is technically a holiday so I have the day off. This will be my 11th year watching the marathon. I want to wish all those who are running this weekend the best of luck! I'll have a drink, or two, in your honor. 3. The best part of coming back from a vacation is when your friends post their own pictures to Facebook. 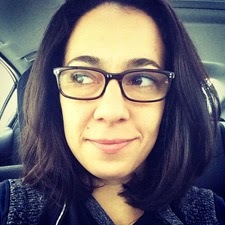 Inevitably, other people's photos are always better, funnier, and more flattering than your own. And then there are the ones that you barely remember taking because you were legitimately drinking wine all day. Those are the best. Please look at the above photo and soak in all of the awesomeness that is occurring. Yes, he is tickling Ashley with his beard. He did the same to me before the picture was taken and it scared the living bejesus out of me. But instead of moving away I just sat there and laughed because I was too stunned and weighed down with a day's worth of wine to do anything else. BEST. DAY. EVER.